I’ve been posting book reviews for some time on LibraryThing.com and finally realized: why not share them here, too? Here’s the first, my thoughts on The Map Thief. I was fascinated to know why the thief in question, a dealer named Forbes Smiley, stole so many rare, valuable maps and destroyed many of the atlases they were collected in, but of course his motive was an old and familiar one: greed. Nevertheless, it’s hard to imagine why a man who devoted his professional career to studying these historical gems could remove them from public access so callously. 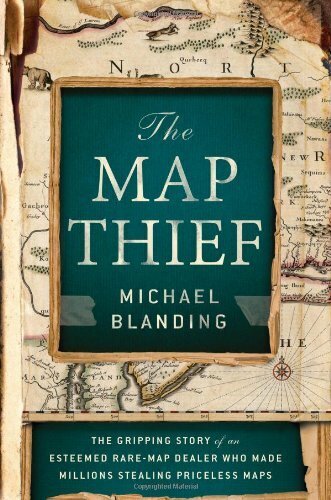 Blanding’s book is filled with tidbits that made me curious to study maps myself. Who knew that the notion that California was an island surfaced in the 1500s and persisted until Spanish king Ferdinand VI ruled in 1747 that it was, in fact, not an island? He had to outlaw future mapmakers from portraying it that way. Many libraries only discovered their maps were missing after Smiley’s arrest, and not all have been recovered. Our public institutions have had to spend a lot of money beefing up their cataloging systems and security measures. How sad–our children aren’t safe in their front yards anymore, we have to strip off our shoes and belts to get on planes, and now our libraries have been violated and our freedom of access has been altered because of one man. This is a fascinating book. I recommend it. Disclosure: my copy was provided to me by the publisher through a LibraryThing giveaway.